We kick off the show with some reviews of the Indian Summer Festival from Rohit, Arts Reporter. Last week, Sara Lapsley talked to Cate Rimmer (click for podcast!) 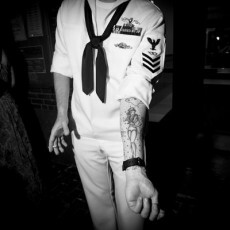 about TATTOOS & SCRIMSHAW – the Art of the Sailor at the Vancouver Maritime Museum. This week Kathryn “Kitty” Mussallem, photographer and sailor aficionado will come on board live in studio to tell us some Salty Sailor Tales. You can hear all sorts of tales and check out Skin and Bone at the VMM July 18 and through October. We’ve been talking about this for ages, it’s great to finally get to hear some salty tales.